My grandmother had a love for appetizers. She kept them simple most of the time. Cheese, salami and crackers usually. It was only for special occasions - holidays and the 49ers in post season - that she stepped up her game. She made calm dip. And not just any clam dip. This dip requires patience because it has to bake for 3 HOURS! I made this for Thanksgiving this week because Jake loves this stuff (as do I) and this was the one dish he requested we have over and above the traditional Thanksgiving fare. So open a beer to drink while you make this but remember to save two tablespoons for the recipe. Cut off top of round sourdough loaf and set aside. Hollow out loaf. Be careful not to create any holes in the loaf when you are hollowing it out. This is what you are baking the dip in. Save the bread removed from the hollowed out loaf; you will use it later. In a medium bowl, combine the next 7 ingredients and stir untill well blended. Fold in clams. Spoon mixture into loaf. Cover with the bread top. Wrap completely in foil. Bake at 250 for 3 hours. 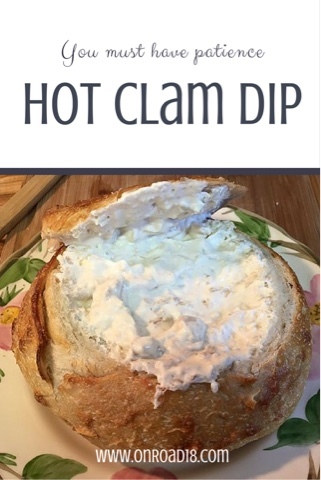 Serve hot clam dip with the torn pieces of bread you reserved. Enjoy! Thank you Grandmother, what a dip. Post her other recipes!